I'm in a Lotus and running tenth at Valencia in a 20% distance race, with 'hard' opponent AI. Tenth is crap - I know this. But it also represents an opportunity to bag my first world championship point. However, due to a killer lack of KERS in my Lotus, I'm flagging and doing everything possible to keep the guy behind me at bay. I move right to block and suddenly a hell of a noise starts up in my right ear. What's happening? My engineer comes on over the radio. A puncture. In one instant, the whole weekend has come undone. 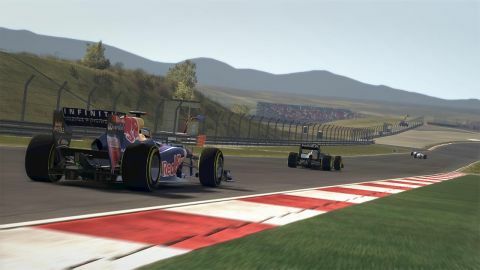 This is F1 2011, and I love it. Being a Codemasters racer, of course, the game features a 'Flashback' rewind option so I could just go back and let the guy through instead. To me, that would feel like cheating, but it's a happy safety net and one which I applauded in last year's game when I gave it 9/10. That game has numerous bugs (hey – I called the pit bug first) but its values are well placed and the sequel needs only subtle improvements and fixes to make this truly essential. Well, they're here - and some of them are real eye-openers. For starters, the cars now have suspension. The reason you kept spinning at the right-hander (Portier) after the hairpin at Monaco? You rode the kerb, dummy. F1 2010 doesn't let you attack kerbs because they throw the car off balance to the point that you'll almost certainly spin if you try it. The new game is totally different. You can chuck the car over apexes, feeling the 'thump thump' through your controller or racing wheel as you go. You have greater confidence in your car as a result – and that means more freedom to enjoy the ride. Above: Traction control on medium... and it let me use the kerbs at Portier? What dark magic is this? There are several difficulty levels, from an idiot-friendly 'Easy' mode which brakes, blinks and breathes for you, through to a ludicrously-challenging Expert mode which is controllable (just) but will make your lap times look like they were set by James May. I settled for the next one down, Professional, which has moderate traction control, manual gears and no racing line. And boy, is it a handful. In this mode, the car handling is completely different to last year's game. On default settings, the cars suffer from pretty severe oversteer through fast corners, which means the back of the car likes to step out as you turn, which will turn into a full-blown spin if you don't correct it in time. It makes every corner a challenge for a racing fan, and feels terrific when you get it right – or when you start tinkering with the set-up and fix the problem at its source. I didn't bother much with the car set-up options last year, as they didn't seem to make too much difference and I'm normally happy with a simple soft/hard tyre choice and front and rear wing angle. But F1 2011 somehow makes the more minor tweaks fun and now I'm all over them. Using the practice session to take the car out on the track, get a feel for its handling then come back into the garage and adjust roll bars, ride-height and the aerodynamics is surprisingly entertaining. Incredibly, I even started altering gear ratios – something I normally leave well alone – to avoid hitting the rev limiter halfway down the longer straights. Don't worry if this sounds too much for you. A novice racer can simply turn the traction control to full and do just fine. But if you have even a basic interest in getting the car to handle how you want, you'll be in car geek heaven with the options available.